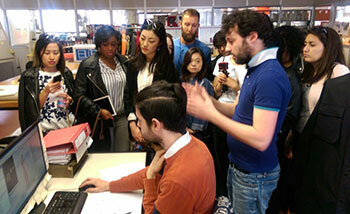 Earlier this month, students from the GCU London’s Fashion programmes joined students from Glasgow on a trip to Milan. Students from the London programmes; MSc Fashion Business Creation and MSc International Fashion Marketing, joined students from MSc International Fashion Marketing in Glasgow for a visit to one of the fashion capitals of the world. The trip included a visit to Italian manufacture, La Rocca SRL, who produce clothing for luxury brands such as Fendi, Dior and Armani. The group also visited the Jil Sander showroom, and had the opportunity to take part in a guided fashion tour, including Milan’s many shops! Students were given a tour of the La Rocca factory as well as shown their new 3D software before the owner opened up the factory outlet where students could purchase samples from brands including Fendi, Dior and Armani. They also visited the Dolce & Gabbana menswear store, following a talk with Vincent who highlighted bestsellers and their new collection. There was also a jacket in the store that was totally exclusive and the only jacket of its kind in the world! MSc Fashion Business Creation Programme Leader, Erica Charles, said: “This trip allowed our students to hear first-hand from some of Milan’s leading industry specialists. “Students were privileged to see a demonstration of some of the most state-of-the art technology used in manufacturing, as well as hear a personal account of how to build a successful career in luxury retailing. MSc International Fashion Marketing student, Yuhsien, said: “I really enjoyed the trip. It was entertaining as well as educational.